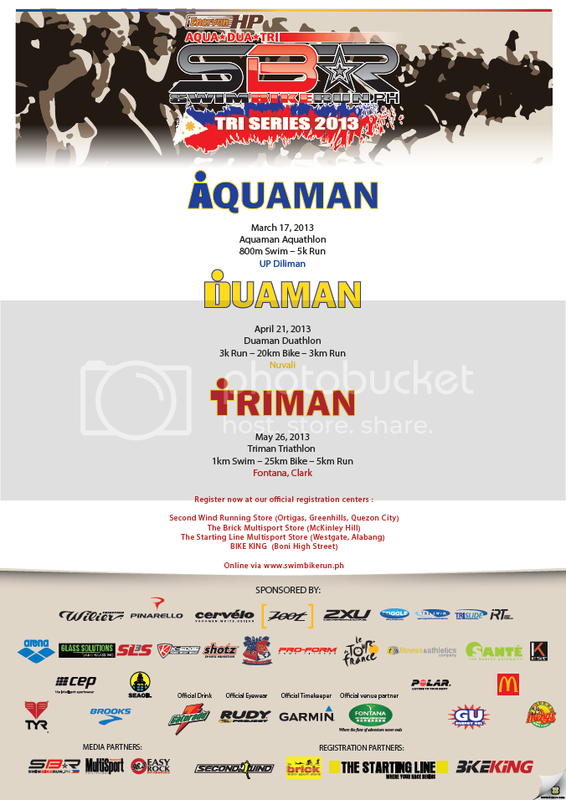 Start the year right and get ready for the inaugural SWIMBIKERUN.ph Tri Series! Be part of SBR.ph’s history and SWIM, BIKE, and RUN with us! Aquaman, Duaman, and 3pack registration is now closed. The SBR.ph Tri Series is a 3 stage multisport series designed to be easy enough for newbies yet challenging enough even for the seasoned triathlete. It is the first ever race series organized by SWIMBIKERUN.ph and will surely be the first in the Philippines in a lot of other things! Why an Aquathlon, a Duathlon, and then a Triathlon? “Slowly but surely”. We made the series a 3 stage event because we want everyone to experience the whole multisport journey. Multisport is not just about triathlon. It also has other events like the aquathlon and the duathlon which are also challenging events in their own right. When are the races and what are the distances? Click here to view complete details of the Duaman Duathlon. Click here to view the start list. Are those race names real?! Why are they in color and what’s up for grabs? 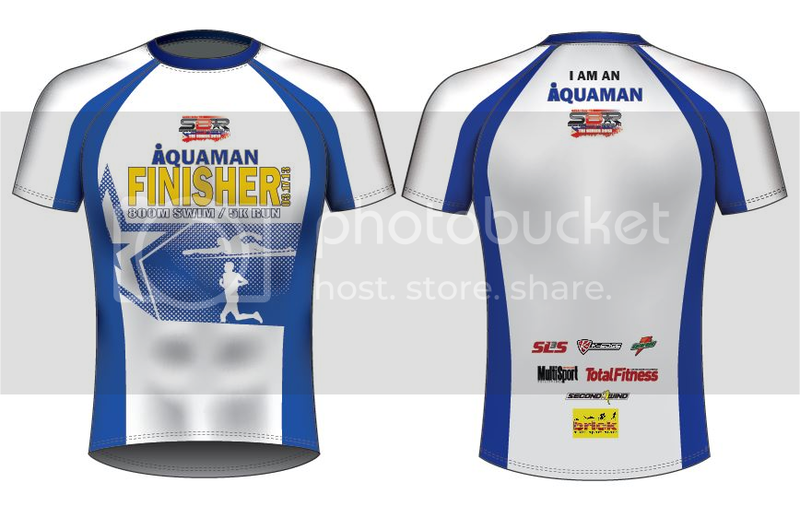 For every stage, all finishers will receive a custom Aquaman, Duaman, and a Triman shirt and medal. Collectors item? You betcha! Complete all three and you’ll also receive a limited edition 3-fecta reward. 🙂 We’ll post a sample of that really soon! Is the SBR.ph Tri Series only for newbies? Ok, now for the more important stuff, how much and where can I register? 5. Keep a copy of the completed registration form and the deposit slip for safekeeping. to future races. Race numbers are non-transferable. 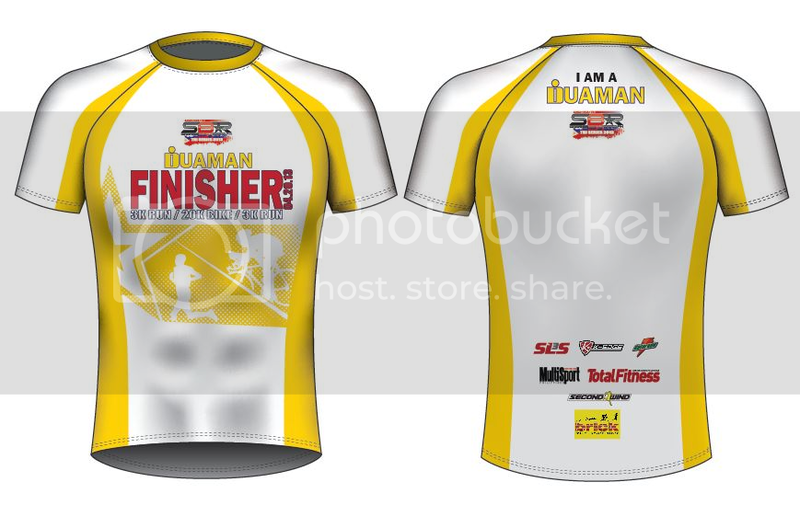 Finisher shirt and medal for all participants. Refreshments before, during, and after the race. 4. Keep a copy of the completed registration form and the deposit slip for safekeeping. NO HELMET, NO ENTRY, NO REFUND. 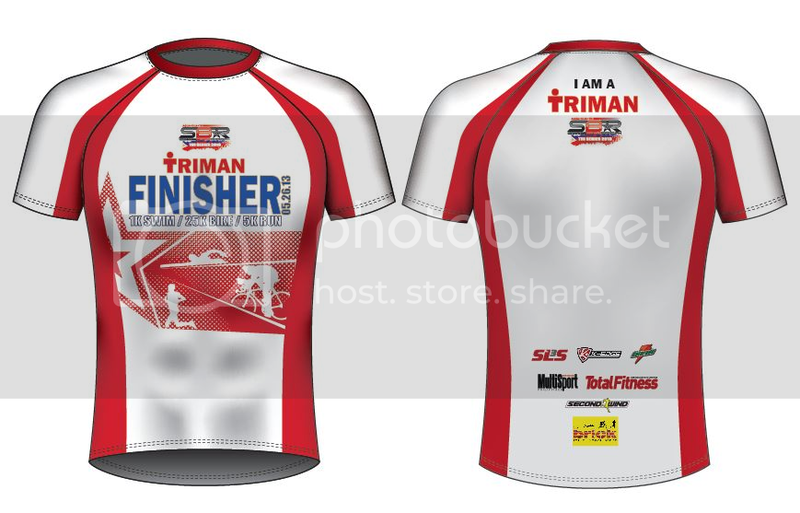 i like the triman logo, parang ironman! I’m a total noob in Duathlon and I’ve been wanting to try this since last year. I will definitely join this event, I’d like to know if folding bike is allowed? Is there an erratum on the triman event? 1km RUN – 30km bike – 5km run. Isn’t it supposed to be swim? is there a chance to move the Duathlon event on a later date (1 week earlier or date after April 21)? too bad it coincides with TNF 100. I badly want to debut on a duathlon race this year! When is the deadline of the registration? How will you get the Top 3 overall winners? Is it per event or for the whole series? Cool! dapat talaga per event. See you guys! hi admin, is there a chance to move the DUATHLON race on a later date? it coincides with the TNF 100 race, hope you can consider to move the date of the race on a later date maybe a week or two before or after TNF 100. Thanks! For the DUATHLON in NUVALI, are we going to be running on concrete road, or on the trails? Is the biking part mountain biking in the Nuvali trails, or on the road ? nice. will definitely join the duaman. thinking of aquaman..where in up ang pool??? may bagong pool naba sa loob ng up? anyway, already inked my calendar for the dua…nice shirts and medals too!! btw…when does the registration start of each event??? or continuing registration ito..parang comelec voters’ registration?.. i want to join a duathlon in nuvali but i dont have car to travel my bike. . .hope you help me. . .
galing po ako dito sa pasay. . .
what is the size of UP Diliman pool? length/ depth….thanks! Hi. Any swimsuit regulations? Do we need to use a tri short or tri suit? I was wondering if I could use a quick dry running short for all three events. Thanks. registered last sunday at secondwind gh. i was told that kit will be claimed on the race day itself? tama ba? race week and race day. Just wanted to know kung ilang ikot po sa pool para makabuo ng 800m? paid my registration last saturday at starting line alabang. possible when and where to receive the kit. Hi Wency! Race kits will be distributed next week at The Brick from wednesday onwards up to Saturday 12pm and then also 9am race day. Is duaman racekit included for distribution at The Brick? Will the Triman still be in alabang? @EdwardMaximo Hi. We will move the event. Just finalizing stuff and we’ll make announcement really soon. We’re doing our best to keep it on the same date. @SBRph Admin @SBRph hi admin. Already forwarded/resend my email dated 7 mar 13 with attached registration form/deposit payment slip thru email add [email protected]. Please advice me. Tnx. Any other for the duathlon this year ? Just decided that I would want to try this out but hav no experience in bike. Been running 10k marathons but if ever this will be my first. Thanks. I was wondering if you’ve received the email I’ve sent last night? what time po ang start ng Duaman on April 21? gusto kong jumoin dito and if ever first triathlon ko to..heheh excited nako..
Folding and mountain bikes are allowed. tama b un o typo? uhm question po.. kasi first time ko lang pong jjoin sa triathlon event.. ask ko lang po..
sa swimming – pwede po bang magstop and magrest in the middle or sa dulo lang po? Can you provide the list of participants? Like other organizer do. Can you provide the list of participants? Hi! is there some incoming sked of SBR? tnx!